January 21st: The Today in New York Celebrating 150 of P.E.O. May 31st: Washington State Convention in Vancouver, Wa. September 12th – 14th: P.E.O. Sesquicentennial in Desmoines, IA. This exercise is chalk full of uplifting, inspiring, phrases with a positive frolic down to some sprightly splashes at the end. pink wave listen for the burst of joy which spirals down the piano. According to Webster’s Dictionary, the word “Wonderment” means a feeling of being surprised or amazed. 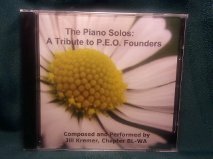 Wonderment of Our World is a CD of piano solos which captures that feeling of surprise. These compositions reflect the natural cycle of the year. This album begins with the Winter Solstice and ends with the October Full Moon. 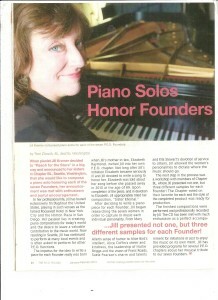 Each piano solo uniquely portrays these various occurrences. One example is in Fall Equinox, one can visualize the leaves blowing around while listening to happy playful phrases. In the song Zenith, riveting runs sweep up the piano and burst into silence,much like a star pinnacle in the sky. Alice Bird Babb was one of seven founders of P.E.O. and was known as the reader of classics, being cultural, intellectual and “Mozartish” which can be heard in her song. A beautifully crafted Mozart like piano solo. A grand, confident composition filled with intricate, delicate touches. Get swept away by the memorable melody. The song closes with a grand entrance! 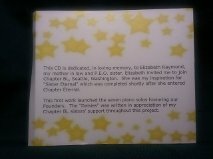 Daisies This song was composed for Chapter BL in honor of all your support. Thank You! 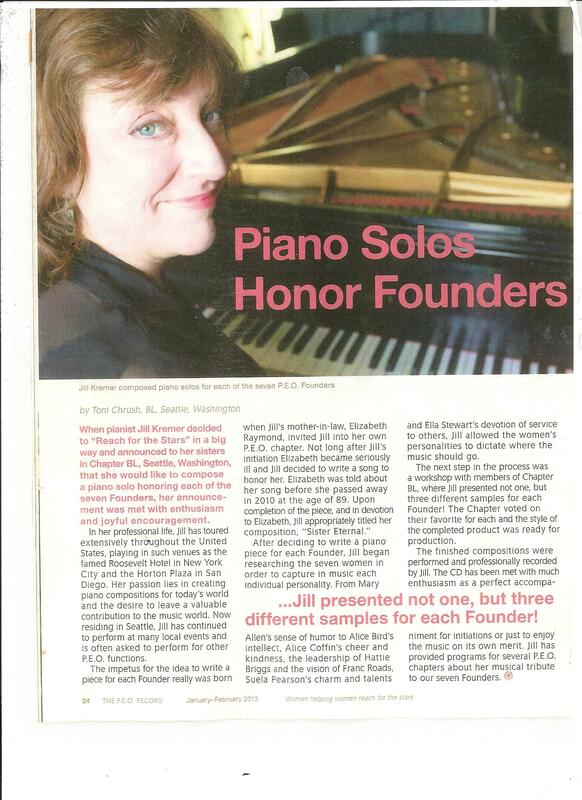 “The Piano Solos” reach North Carolina! Thanks Chapter CB! before she died. It is very reflective, often used for a memorial. Alice’s’ grand entrance at the end. and romantic, according to Jill. very social, also Irish like Jill. music revolves around the Roaring 20’s. Alice Virginia Coffin’s piece is queenly, warm hearted, fun and waltzlike. Jill had a difficult time ending this one. is described as flowing, easy listening and soft. 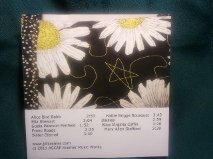 Daisies, is whimsical, contemporary and fast. her to consider a tour in North Carolina so we could enjoy her talent. 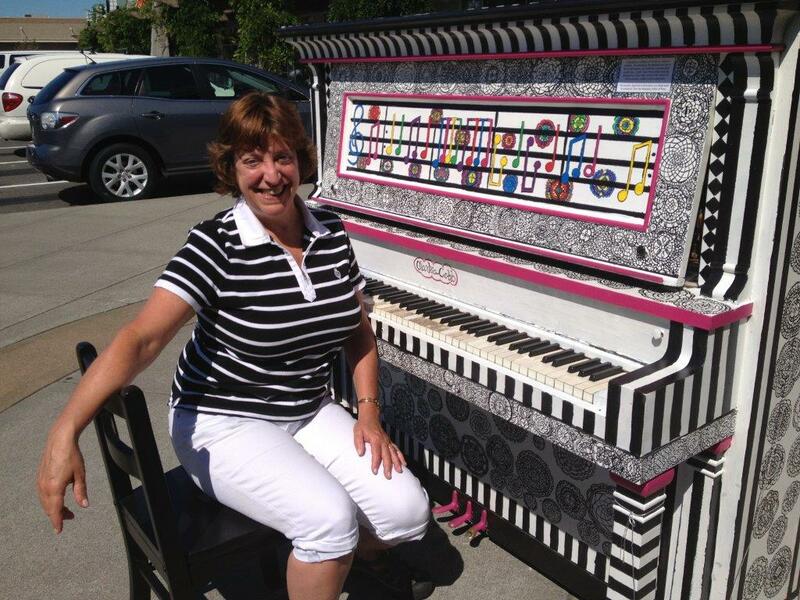 “Piano Time” in Shoreline is back this summer with 5 new pianos! 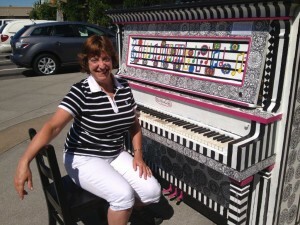 One of the new pianos this year!